Welcome back to live coverage of the Spanish Grand Prix. Next up, FP2. It was a fairly predictable first practice session, with Mercedes a second quicker than Ferrari. But Friday practice is not all about lap times, especially this one as the teams get their heads around the updates they have brought to this race. 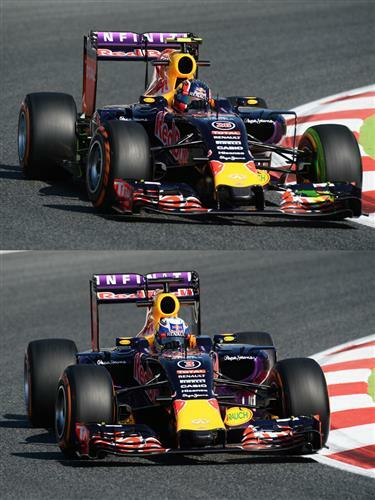 Slept through FP1, so what’s up with the Red Bull rhinoplasty? Botched surgery or snorting sand? I was surprised to see Toro Rosso still on top. @mfbull: The new Red Bull nose is the most obvious upgrade in the pit lane. It is a shorter nose that the car was originally designed for, but the team could not get it to pass the crash test until now. It only ran on Kvyat's car, which is just as well as Ricciardo spent most of his session in the garage. Work on the No.3 car continues ahead of this session - it could mean a penalty if they are replacing the engine. Ferrari's most visible upgrade comes in the form of revised sidepods. And does the Mclaren look any better in person than in pictures? @mfbull: Nate reports that it "looks great in person, certainly compared to the last livery. It looks more badass"
That Ferrari's a looker, why is it the ugly ones never seem to win? What about the new aero pack from williams? @JosePepe: There are only minimal changes to the Williams, certainly in comparison to Ferrari and Red Bull. Does anyone know, how many engine tokens were used by ferrari and mercedes? Ferrari and mercedes gap is still 1 sec, does it mean that ferrari is still not competitive? @leo: I don't know for certain, but we will try to find out. My understanding was that Ferrari would spend up to five tokens in time for Canada but has not spent any so far. That would make sense as Montreal is a power circuit. I've got it! 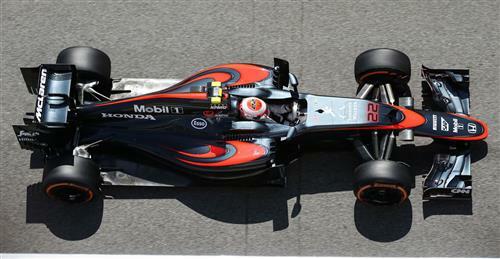 The McLaren has a 'stache! Williams is missing that PDVSA money. More this year than last. @RJ: It depends what you mean by an old engine. Both cars took a new one in Bahrain and so the first (of the four they can use this year) is likely to become the Friday practice engine. They can change between engines relatively easily on a Friday night when they strip the car down and prep it for qualifying. Only hard tyres used so far and Nico Rosberg leads the way in the Mercedes with a 1:29.075. So how does the panel feel about the Mosley Solution? Open regs for teams that stick to a $100 million cap. development. @mfbull: It's an idea that has been knocking around for a while. I'm all for it but haven't got much of a response when I've posed the question to people in the paddock. Red flag. There is some debris on the track. The engine cover of Grosjean's Lotus was torn off on the pit straight. I'm not sure whether it was incorrectly attached or something went bang inside. The car returned to the pits, so I guess it was a bodywork failure rather than anything inside. Not good news for Grosjean who lost FP1 vacating his seat for Jolyon Palmer. The whole of the engine cover was blown off, leaving the internals bare as the car returned to the pits. Is that Merc is showing their true potential in barcelona by letting the cat out of the bag? Have they been a littel conservative all these four races? @rockedin123: It's still early in this GP weekend, but I suspect Mercedes will be rather dominant here. Green flag again and Kvyat on track in the Red Bull with its new nose. Have Grosjean done for indecent exposure. Hamilton is now down to a 1:27.826, which is over a second quicker than anybody else. But we have yet to see quick runs from any of the drivers this session or a lap on the medium tyres. @mohammed: Rosberg set a 1:22.792, but that was on soft tyres after six days of rubbering-in the track. Vettel goes fastest with a 1:27.260 on the medium tyres. Raikkonen is also out on the softer of the two compounds. Vettel says he has "a lot of vibrations" on his set of medium tyres. 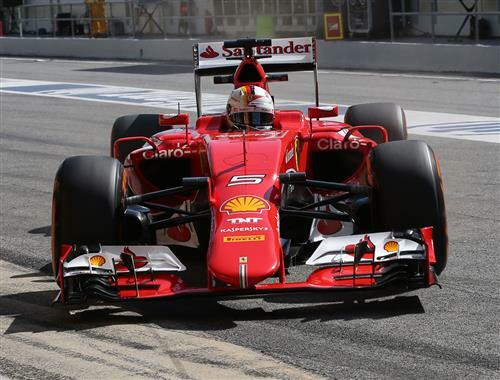 What is that the new sidepods mean for the Ferrari? @rockedin123: It looks like they are tightening up the bodywork, which will help with aero and is possible due to Ferrari's impressive cooling. Hamilton is sat in the garage waiting while mechanics see to his Mercedes.